Welcome to a multipolar world. The Moscow-Washington agreement of September 10th on Syria, reached after 10 months of hard bargaining and now in shambles after another broken truce, had one crucial if little noted aspect. For the first time since the Soviet Union imploded, Russia managed to put itself on the same diplomatic footing as the United States. As Russian Foreign Minister Sergey Lavrov commented, “This is not the end of the road… just the beginning of our new relations” with Washington. Even though those relations are now in a state of suspension and exacerbation, it’s indisputable that the Kremlin’s limited military intervention in Syria was tailored to achieve a multiplier effect, yielding returns both in that war-ravaged, devastated land and in international diplomacy. To save his regime from collapse, the Kremlin’s military planners decided to fill the gaping hole left by Syria’s collapsing air force, shore up its air defenses, and boost its depleted arsenal of tanks and armored vehicles. For this, they turned one of Russia’s last footholds abroad, an airbase near the Mediterranean port of Latakia, into a forward operating base, and shipped to it warplanes, attack helicopters, tanks, artillery, and armored personnel carriers. Russia also deployed its most advanced S-400 surface-to-air missiles there. The number of Russian military personnel dispatched was estimated at 4,000 to 5,000. Although none of them were ground troops, this was an unprecedented step in recent Russian history. The last time the Kremlin had deployed significant forces outside its territory—in December 1979 in Afghanistan—proved an ill-judged venture, ending a decade later in their withdrawal, followed by the collapse of the Soviet Union in December 1991. “An attempt by Russia and Iran to prop up Assad and try to pacify the population is just going to get them stuck in a quagmire, and it won’t work,” said President Barack Obama at a White House press conference soon after the Russian military intervention. He should have been an expert on the subject since a US-led coalition had been bombing targets in Syrian territory controlled by the terrorist Islamic State (ISIS) since September 2014. Nonetheless, the Pentagon soon signed a memorandum of understanding with the Kremlin over safety procedures for their aircraft, now sharing Syrian air space, and established a ground communications link for any problems that should arise. Between October 2015 and August 2016, top officials from Saudi Arabia, the United Arab Emirates, Qatar, Bahrain, and Turkey all held talks with Putin at different venues. The first to do so, that October, was the Saudi defense minister, Prince Muhammad, a son of Saudi King Salman. They met at the Russian president’s dacha in the Black Sea resort of Sochi. Saudi Arabia had already funded the purchase of CIA-procured TOW anti-tank missiles, which had largely powered a rebel offensive against Assad in the summer of 2015. Now, the two agreed that they shared the common goal of preventing “a terrorist caliphate [ISIS] from getting the upper hand.” When Saudi Foreign Minister Adel al-Jubeir mentioned his concern about the rebel groups the Russians were targeting, Putin expressed readiness to share intelligence, which meant future cooperation between their militaries and security services. The ruler of Qatar, Emir Tamim bin Hamad al-Thani, went a step further after meeting Putin at the Kremlin in January 2016. “Russia,” he declared, “plays a main role when it comes to stability in the world.” Along with Jordan, Qatar had been providing the CIA with bases for training and arming anti-Assad insurgents. A month later, the next Gulf chief to call on Putin in Sochi would be King Hamad bin Isa al-Khalifa of Bahrain, which has hosted the US Navy’s Fifth Fleet since 1971. He presented a “victory sword” of Damascene steel to the Russian leader. After their talks, Foreign Minister Lavrov reported that the two countries had agreed to boost economic and military ties. As an added bonus, Putin had helped solidify his own popularity at home, which had spiked to a record 89 percent approval rating in the wake of events in Crimea and eastern Ukraine at a time when US and European sanctions, combined with low oil prices, had led to a recession that would shrink the Russian economy by 3.7 percent in 2015. It was a striking demonstration that, in domestic politics, popular perception about a strong leader trumps—if you’ll excuse the word—economic realities. This year the Russian economy is expected to shrink by perhaps another 1 percent and yet in recent parliamentary elections, the Putin-backed United Russia party won 54 percent of the vote, and 343 of 450 seats. During his visit to Beijing last June, Putin cited 58 deals worth $50 billion that were then being discussed by the two governments. 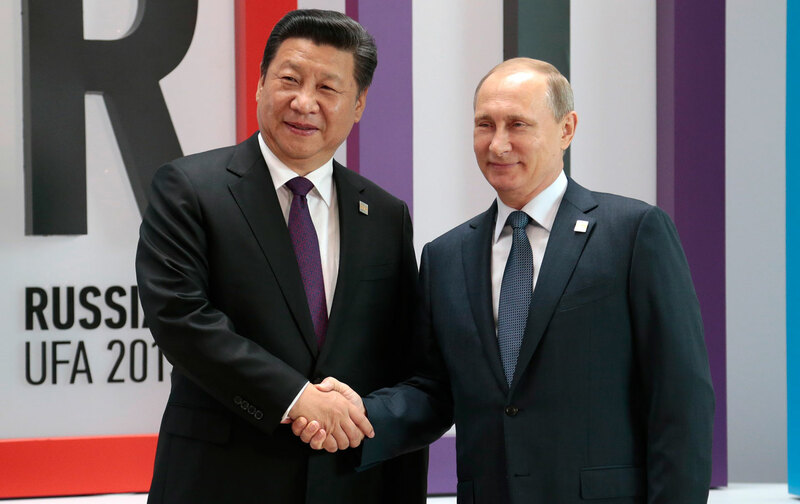 Russia was also preparing to issue yuan-denominated sovereign bonds to raise $1 billion and discussing plans to link China’s national electronic payment network to its own credit-card system. The two neighbors were already partners in a $400 billion deal in which the Russian energy-company Gazprom is expected to supply China with natural gas for the next 30 years. As an example of the Sino-Russian geopolitical convergence in action, RAdm. Guan Youfei, head of China’s Office for International Military Cooperation, recently visited the Syrian capital, Damascus. He met with Syrian Defense Minister Fahd Jassem al-Freij and held talks with the Russian general coordinating military assistance to that country. Guan and al-Freij agreed to expand Chinese training and humanitarian aid in order to counter religious extremism. In 2010, President Obama launched his “pivot to Asia” strategy to contain China’s rising power. In reply, within six months of becoming president, Xi Jinping unveiled a blueprint for his country’s ambitious One Belt and One Road project. It was aimed at nothing less than reordering the geostrategic configuration of international politics, while promoting the economic reconstruction of Eurasia. Domestically, it was meant to balance China’s over-reliance on its coastal areas by developing its western hinterlands. It was also to link China, Southeast Asia, South Asia, and Central Asia to Europe by a web of railways and energy pipelines. In February 2015, the first cargo train successfully completed a 16,156-mile round trip from the eastern Chinese city of Yiwu to Madrid, Spain, and back—a striking sign of changing times. In 2014, to implement its New Silk Road project, Beijing established the Silk Road Fund and capitalized it at $40 billion. Its aim was to foster increased investment in countries along the project’s various routes. Given China’s foreign reserves of $3.3 trillion in 2015—up from $1.9 trillion in 2008—the amount involved was modest and yet it looks to prove crucial to China’s futuristic planning. In January 2015, the Chinese government also established the Asian Infrastructure Investment Bank (AIIB) in Beijing. Two months later, ignoring Washington’s urgings, Great Britain became the first major Western nation to sign on as a founding member. France, Germany, and Italy immediately followed its lead. None of them could afford to ignore China’s robust economic expansion, which, among other things, has turned that country into the globe’s largest trading nation. With $3.87 trillion worth of imports and exports in 2012, it overtook the United States ($3.82 trillion), displacing it from a position it had held for 60 years. China is now the number one trading partner for 29 countries, including some members of the 10-strong Association of Southeast Asian Nations (ASEAN). This may explain why ASEAN failed to agree to unanimously back the Philippines, a member, when the Arbitral Tribunal at the Permanent Court of Arbitration in The Hague ruled in July in its favor and against China’s claims to rights in the South China Sea. Soon after, China announced the holding of a 10-day joint Sino-Russian naval exercise in those waters. Reflecting its expanding gross domestic product (GDP), China’s military expenditures have also been on the rise. According to the Pentagon’s annual report on the Chinese armed forces, Beijing’s defense budget has risen 9.8 percent annually since 2006, reaching $180 billion in 2015, or 1.7 percent of its GDP. By contrast, the Pentagon’s 2015 budget, $585 billion, was 3.2 percent of US GDP. A study of its naval doctrine shows that it is following the classic pattern set by the United States, Germany, and Japan in the late nineteenth century in their quest to become global powers. First comes a focus on coastal defense of the homeland; second, establishing the security of its territorial waters and shipping; and third, the protection of key sea-lanes it uses for its commercial interests. For Beijing, safeguarding the sea-lanes used to bring Persian Gulf oil to the ports of southern China is crucial. The ultimate aim and fourth stage of this process for an aspiring world power, of course, is power projection to distant lands. At present, having reached the third stage in this process, China is laying the foundation for its final goal with a Maritime Silk Road project, which involves building up ports in Burma, Bangladesh, Sri Lanka, and Pakistan. At the moment, Chinese leaders do not seem to imagine their country openly challenging the United States for world leadership for, minimally, decades to come. Ten years ago, the Beijing-based Chinese Academy of Social Sciences, the country’s most prestigious think tank, came up with the concept of “comprehensive national power” as a single, carefully calculated number on a scale of 100. In 2015, the respective figures for America, China, and Russia were 91.68, 33.92, and 30.48.